The ATF has failed to inspect 58% of licensed gun dealers every five years because of understaffing and other obligations, the Houston Chronicle reports. The Justice Department’s inspector general examined data from 2007 to 2012. 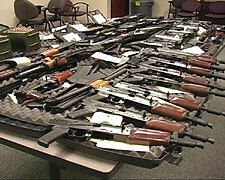 The report also criticized the ATF’s failure to track its industry operations investigators. Most of the blame falls on “insufficient investigator resources,” Justice Department Inspector General Michael Horowitz said, the Chronicle reported. Posted: 4/24/13 at 9:22 AM under News Story.